Use your creativity to super size a stamped image. Loosely draw the enlarged image, cut the image into different pieces then trace the cut pieces with a ruler to get some nice straight lines. Paint everything except the dormer white. 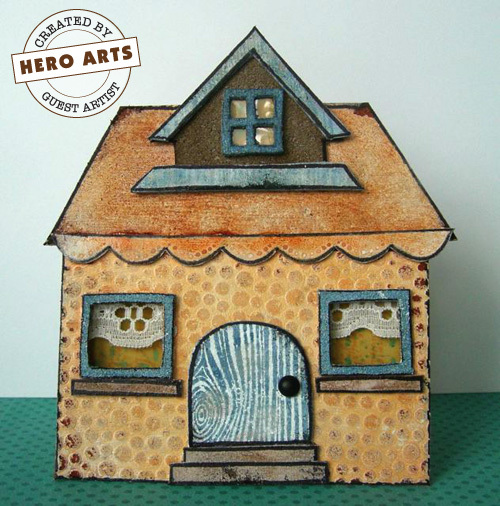 Add texture by stamping the door with the Woodgrain stamp and emboss the body of the house with a Cuttlebug template. Add color with distress inks. Sand in random places gave the house some more character and glued it all down with Glossy Accents. Add some scraps of stamped paper to serve as wall papers in the window squares. Add lace to the back windows on the house. Add texure to your cards for added interest.